Yogablogging: various notes about, and/or random thoughts inspired by, the yoga course I did last month with Nancy Gilgoff. Part Two. Nancy says there are a lot of people hurting themselves in yoga these days – lower back, neck, knee and hamstring injuries – and there weren’t twenty years ago. 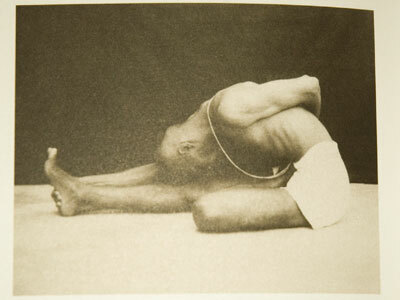 Some advanced yoga practitioners demonstrate forward bends with impressively straight backs. Note that Nancy absolutely isn’t against Iyengar yoga as a form of practice in it’s own right and speaks with very high respect about Iyengar teachers she has studied with – it’s the mishmash of styles and confused mixing of ideas about how to do things that she’s against. … to suggest that “alignment” is of utmost importance and lack of this “alignment” is dangerous, is in itself an uninformed statement. All this hang up on starting a pose with a particular perception of “alignment” is from the BKS Iyengar newfangled method. This eye towards “alignment” is also increased by an attachment and false application of classical form (a western art, dance contrivance) laid onto the yoga system. “Alignment” in an asana develops over time with daily practice. It arises out of proper breath and gaze with mula and uddiyana bandhas. If the student or teacher is looking to create a renaissance inspired form of beauty in order to experience or begin the pose, then he or she is not practicing yoga but posing (ooh pretty). Many long time ashtanga practitioners develop a graceful quality and line in their practice …. Many long time practitioners do not develop this quality yet have extraodinary, advanced practices with deep insight and experience of the practice as well as of yoga’s many facets. Should we judge a practice by this usually false graceful packaging? No way. Because geting hung up on “alignment” and slow, balletic movements are the biggest pitfalls and side tracks of an ashtanga practice. Focus on this crap and you'll never know what ashtanga practice is. I am not engaging in some kind of ashtanga-versus-Iyengar sectarian Yoga War here. I have nothing against Iyengar yoga as such(*) – except where its ideas about how to do things intrude where they don’t belong, or when some of its practitioners falsely claim that theirs is the only safe and “correct” way to do things. I don’t like ashtangis who do that either. (*) In fact, I have so little against Iyengar yoga that, this winter when my ashtanga teacher is in Mysore, I plan to go to classes with a friend of mine who teaches it. Not with any intention of switching, just to see what I might be able to learn from a slightly different yoga perspective. Notes from the previous course I did with Nancy.